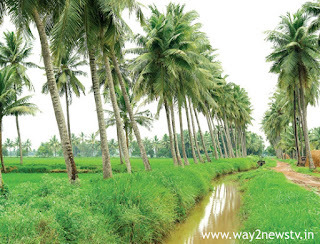 Amalapuram, January 11, (way2newstv.com) : Farmers are suffering from Rabi cultivation when the irrigation availability in Godavari has fallen. The water was released from Sailar to the Godavari and the suburbs of Konasema were untouched. The irrigation that has not yet been planted in thousands of hectares due to irrigated water supply to the suburbs. In the Middle Delta, 45,150 hectares of rye has 21,000 hectares.The situation is worse in about 4,000 hectaresOriginally, the knot should be completed by December 31. In the district, Rabi has been cultivated at 1.64 lakh hectares and only 60 per cent has been planted so far. The fact that the agricultural officials are suggesting farmers to complete the rice at 15th of this month is in fact different. There are still no better conditions in irrigation supplies. The Agriculture Department has sent a report to the collectorate to provide irrigation to fill the drains in the middle delta. They explained that the irrigation conditions in the irrigation system or 15 zones were bad. Some villages in Ampalapuram, Allavaram, Anavililli, Upalaguppam, P. Gannanavaram, Ambazipeta, Mamidikudur, Rajo, Malikipuram, Sakhinetipally, Mummidivaram, I.Polavaram, Katrineikona, and Poo Petta Mandals are not in the villages. Agriculture officials have urged the authorities to arrange irrigation facilities in the villages of Kakinada Rural Zone in addition to 9 villages. Coordination deficit has also been caused by water resources and agriculture officials for the issue of irrigation supply to the suburbs in Rabi. Farmers are struggling with lack of understanding between the two branches. There are criticisms that the farmers are not able to alert the processes in irrigated conditions. In addition, engineers have now been transferred with the promotions in the water resources department. The situation has become more intense as new engineers come to many divisions. This is the responsibility of the district authorities to ensure that the farmers are not upset by coordinating them all. The water resources department has taken up the issue of irrigation water supply to the suburbs of Konaseema and steps are being taken to overcome difficulties in irrigation water supply. In the suburbs of Konaseema, crop areas are still visible today. Some farmers are spending water into the crops with the help of orchids for many expeditions. From there, they are wrestling with oysters to fill the water into the bed. Some of the self-sustaining water from the canals to the aqua crop is also caused by irrigation problem. The problem of irrigation is going on in Amalapuram constituency. The farmers are facing severe irrigation for irrigation in the areas of Tadikona, Gudala, Entrokkona, Devaguptham, D.Ravarapalem and Benthulankulam suburbs in the Alavaram mandal. This resulted in a loss of 50 percent still in those areas. The situation in the suburbs of Upalaguptham and Amalapuram rural areas is also the same.